I'm not sure how anyone could have enough free time to create this, but I'm glad they did. If you are studying state capitals in school, or just curious, here are all 50... through snippets in movies. Weekly World News - flag "fail"
I put "fail" in quotes, because, of course, everything in Weekly World News is a silly joke. After all, this is the paper that once defended itself in a libel case by telling the judge that no one actually believes anything they write. 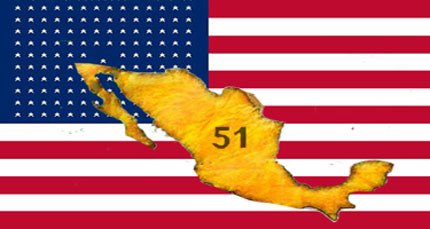 So I wasn't all that surprised by an article that claims Mexico will be the 51st state. It's all in good fun. But what was surprising was the flag they used to illustrate the story (above). It has 140 stars! I could understand a 51-star flag, or maybe a flag with 81 stars.... adding in the 31 states of Mexico. But a 140 star flag? Does no one at the paper know how many states we have? Or did they think their audience is stupid enough to think that 50 + 1 = 140. Oh. Just four US states are less than 100 years old. Can you name them? 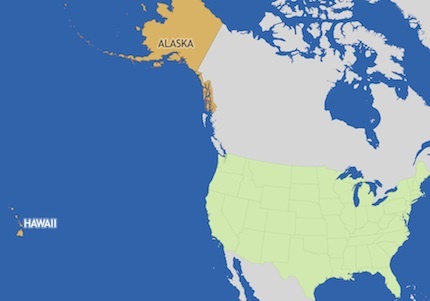 Two are so easy, I included them on the map above: Alaska and Hawaii. But can you name the other two youngsters? The answer is here. So an outsider comes to town and shoots one of the locals dead in cold blood. The shooter is then hailed as a hero, and the townfolk decide to name a county after the killer. This is the true story of Louisa County, Iowa. In the 1830s, William Smith wanted a mining claim owned by the Massey family. So Smith and his son shot and killed Woodbury Massey... and then rode through town proclaiming that they'd kill any other Masseys they could find. At this point, Woodbury Massey's brother, Henry, took preemptive action and killed William Smith. Then the story gets interesting. 16-year-old Louisa Massey, sister of Woodbury and Henry, arrives in town and cooly proclaims she's just doing some shopping. But when she spots the younger Smith in the store, she pulls out a gun and shoots him dead too. Louisa became an instant hero. Newspaper reports wrote: "The upper river county went wild with her praise. No war hero was ever welcomed with greater enthusiasm... cheering throngs greeted her at every stop." What is the moral of this story? I have no idea. Certainly, no one today wants 16-year-old girls involved in revenge killings. 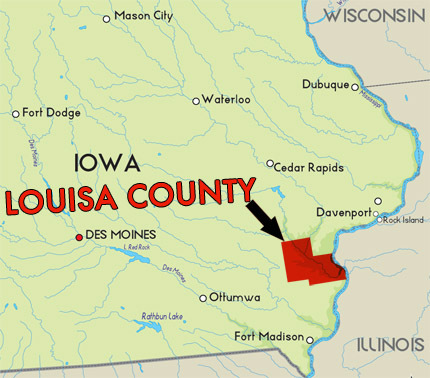 It might be one thing to exonerate Louisa, but to make her a hero, and name a county after her? It all seems very strange. You might explain it by saying that times were different then; but after Lincoln was shot, nobody was clamoring to create John Wilkes Booth county. About the only explanation I can come up with: the Smiths must have been some really mean and nasty dudes. Why is this street sign illegal? 2010 ACTUAL QUESTION: Tropical forests are being destroyed at the rate of at least eleven million hectares each year, an area the size of Pennsylvania. About half of all tropical forests are already gone. Discuss two major reasons for this high rate of tropical deforestation. No serious scientist today would validate this number. It dates back to a rough estimate made by a single Brazilian scientist looking at satellite photos of fires in the Amazon—in the 1980s! Yeah, it's a 30-year-old number based on sketchy information. Scientists today put the number at one-tenth that figure. This implies there is a steady onslaught of rain forest destruction. Not so. There were some bad years in the 1980s, but things have changed radically since then. A report from last year showed a 90 percent drop in lost forest area. "About half of all tropical forests are already gone"
Why is this sentence here? Seriously; it is absolutely unnecessary. The only reason to include this sentence is to make a political point. This seems like an innocent phrase, but it's actually very tricky. 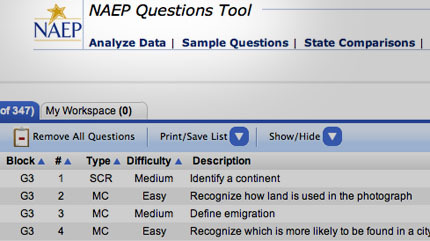 Note how the test uses the term "tropical forest" not "tropical rain forest" That's because the test writers know full well that most deforestation in the Amazon is taking place in the chaco (dry forest) which is not an area of biodiversity. The wet tropical forests have a much slower rate of deforestation than chaco land. Another subtle bias here: The word "already" is unnecessary, added to create a sense of urgency. In truth, deforestation has been going on in the Americas for hundreds of years. Yesterday I was driving through Tichigan. Yes, you read that right. 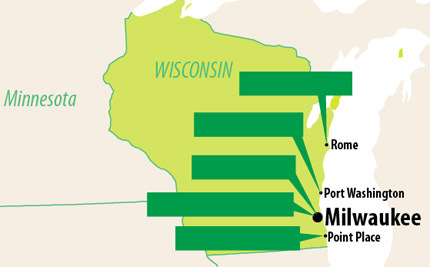 There is a small town on Wisconsin named Tichigan. Passing through, I wondered: how many times do they have to say, "It's Tichigan, not Michigan"? It must be exhausting. That made me think there must be other places that are one letter off from famous locations—causing endless confusion. Like the beleaguered folks from Milwaukie, Oregon... or residents of The Dalles, Oregon (who at least have that weird "The" at the beginning to prevent complete confusion with Dallas, Texas). 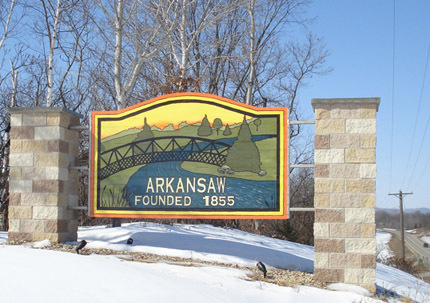 My personal favorite is a small town in Wisconsin named Arkansaw... yeah, with a "w" (above). Of course, the biggest example of this problem is Iran and Iraq; Tim Pawlenty embarrassed himself badly mixing up the two recently. Maybe that's why he left the race. See, geography really is important!